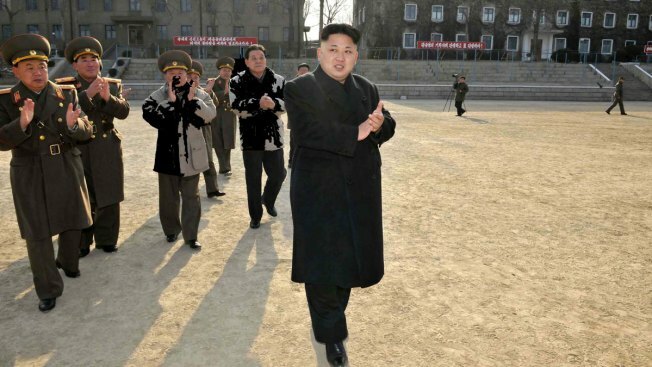 This undated picture released from North Korea's official Korean Central News Agency (KCNA) on January 12, 2014 shows North Korean leader Kim Jong-Un (C, front) inspecting the command of Korean People's Army (KPA) Unit 534. North Korea may be preparing for a nuclear test in the near future, a U.S. website that monitors the isolated nation said Friday. The website 38 North said commercial satellite imagery taken Thursday shows vehicles at a command center believed to control the underground explosions, which could be sign that a test is imminent. The center lies nearly four miles from the test site at Punggye-ri. The website said the level of activity at the test site continues to be low, but vehicles are not often seen at the command center — except during test preparations. Predicting North Korea's nuclear tests is notoriously difficult. The last test, North Korea's fourth since 2006, happened in January and was followed by a long-range rocket launch, drawing the toughest U.N. sanctions yet against Pyongyang. On Friday, North Korea began a ruling party congress to cement the authority of its leader, Kim Jong Un. South Korean officials say the North has finished preparations for a fifth nuclear test and it could happen any day. A U.S. official said Friday the U.S. has seen activity at the site and wouldn't be surprised if there was a test. The official, who was not authorized to comment publicly and requested anonymity, said the assessments have been mixed.